“Spel” was the latest offering from Ensemble Offspring, produced by Tura New Music. In accordance with the increasing push for improved female representation in art-music, four female artists composed the five pieces featured in the program, while the ensemble itself consists of two women and two men, with Claire Edwardes the ensemble’s artistic director. This is proof (though none at all is needed) that there is enough repertoire by women for music programming to include many more works by them. Two pieces by Kate Moore featured: a short study for solo vibraphone and a longer work for the whole ensemble (vibraphone, flutes, bass clarinet, piano). Both exhibit Moore’s looping, minimalist stepping patterns. A series of ascents and descents in the notes is marked out, the rhythms being very slightly asymmetric, and the final notes especially tend to vary from phrase to phrase, preventing full resolution or absolute repetition. These are bright, pleasant works and Edwards (on vibraphone) and her collaborators nailed the irregular counts required. The pieces are crowd pleasers; seductively easy-listening contemporary art-music. More complex in its tonal irresolution was the short study for solo piano from Missy Mazzoli. It is not strictly speaking an atonal work. The clusters of notes tend to stagger across the keyboard in unusual scattered phrases, and it has a great sense of picking itself up and then falling out of rhythm again. The performance begins and ends against a quiet ground of wavering, pre-recorded sinewave tones, though the focus is the piano. Overall, the piece hints at more complex developments, but since it is an early short work from Mazzoli, we do not get that here. It was nevertheless an appealing off-kilter taster, well handled by pianist Zubin Kanga. The stand-out piece is Andrea Keller’s Love in Solitude, performed by the whole ensemble. Again, this is performed with a pre-record, in this case of extended-technique sounds and clunks previously recorded by the live performers. These materials lie behind a recording of a reading of Rilke’s poetry. Initially the recording feels like a solution to not having enough performers, but halfway through, the live instruments come to the fore forcefully and percussively, breaking up the sense of a scattered field of materials and offering a more urgent set of motivic forces. A generally jazzy feel intrudes, and afterwards the larger progression is significantly changed and extremely diverse, moving from minimalist loops, staggered unison gestures, extended preparatory sections or pauses awaiting the next movement, and more. I did not manage to fully decode this diversity on my first listening, but the piece has an abundance of moods, which is a joy for those who like to chase compositional developments as they slip away in performance. As Brophy observes, the practice is tautological and is unlikely to offer insights into the film, or its scoring — particularly when dealing with someone who did such innovative things with scoring as Goddard. The music is okay, but there tended to be an oscillation between what is called “Mickey-Mousing” — music that pops up and makes active changes every time an action happens on the screen; this was most evident when instruments imitated in a non-verbal fashion the act of characters speaking (“Pbbt brrt hrt?” goes the clarinet; “Pah zwee!” goes the flute) — and then into some of the most common clichés of mainstream scoring, namely emphasising the dramatic content of what you see. We see a violent, climactic scene, so we had better have some violent and climatic music, just in case we somehow failed to notice this was a violent dramatic scene. As Brophy observes, this is the sound-and-vision equivalent of tuning the volume up to 11. Subtle it is not. Tura does deserve accolades for its promotion of sound-and-vision work in Perth, though music venue conditions can hamper efforts at realisation, despite the best of efforts. With Ensemble Offspring, the location of the screen meant that the musicians obscured the view of the film’s English language subtitles for audience in the first four rows. Although the projection itself was otherwise crisp, it was also ever so slightly out of proportion, making everything on screen look wider than it should. Having said this, Ensemble Offspring provided a delightful night of well executed works which varied from the seductive to something closer to Laurie Anderson’s so-called “difficult listening hour.” For sound and vision fans, stay tuned for the announcement of when electronica vision-and-music maestro Robin Fox will be performing. Pictured top: Zubin Kanga (piano), Lamorna Nightingale (flutes), Jason Noble (clarinet), Claire Edwardes, (percussion/artistic director). Photos: Rachael Barrett Photography. Intercurrent is an exciting new music ensemble based in Perth. The initiative came from some of the best local conservatory-trained musicians: composer Lachlan Skipworth, percussionist Louise Devenish, pianist Emily Green-Armytage and clarinettist Ashley Smith. They’re supported by Tura New Music – a small but distinguished organisation that emerged, thirty years ago, from the somewhat shrouded world of contemporary-classical and experimental art music. As with any other niche, there is a small community of diehard followers who will attend anything – rain, hail or shine. In my days as an eager composition student, I probably would have considered myself among the enlightened few. But in recent years I stopped going to these sorts of concerts. I stopped connecting with what I was hearing; I couldn’t tell if I actually enjoyed myself – was I just pretending? I became disheartened by the small, selective audiences. And becoming a composer seemed to me a hopeless, pointless, spurious endeavour. That is to say, I came to “Sensory Horizons” with my own baggage. The evening began with a casual pre-concert talk on stage, facilitated by musicologist Sarah Collins. She spoke with Smith and Devenish about the origins and intentions of Intercurrent. The two musicians admitted, with a slight hint of sheepishness, that they were all “closet minimalists” – that they admired composers such as Philip Glass, whose distinctive style (emerging from New York in the latter part of the twentieth century) continues to influence today’s film composers, electronic music producers, math rock bands and a whole host of artists across various disciplines. Minimalism (in music) is something most people have heard without having heard of. It’s characterised by simple motifs, repetition, layering, and a harmonic clarity that makes it far more accessible than other forms of art music. Both the listener and the performer become acutely aware of the medium of music itself: time. Intercurrent decided to name this particular concert “Sensory Horizons” because the pieces they programmed showcased the horizontal aspect of music more than the traditional vertical aspect. This kind of music comes to life like a Bob Ross painting, where plain backgrounds – flat, meaningless, washes of colour – transform into majestic landscapes with each stroke. Figures within the composition are always suggestive and never imposing. Such is the exquisitely paced multi-media work by John Supko, This Window Makes Me Feel (2005). The piece begins with a tape recording of incomprehensible whispers and shuffling. Above the stage, there’s a video projection: we seem to be looking through the eyes of somebody walking through Manhattan. Their gaze darts around and their perspective is always obscured – by rain drops, by diffused glass – so that nothing is seen clearly. On top of the whispering, which sounds like the internal monologue of an anxious introvert (takes one to know one), we hear stirrings of piano, vibraphone, muffled bell chimes and bass clarinet. The sounds build and fade over a length of time that at first feels tiresome, then revelatory. The juxtaposition between the emotionally unsettling audio-visual elements and the calmly persistent instrumental lines was profound. It was a treat to see the core members of Intercurrent joined by some special musical guests: violinist Akiko Miyazawa, cellist Jon Tooby and Michael Howell on flute. They featured on the last three pieces of the program: Subito, an energetic violin piece by Witold Lutosławski; and two exciting pieces by Perth composer Lachlan Skipworth, The Crossing II and The Crossing I. It’s not often you get to see classically-trained musicians performing works with which they have such a strong personal connection. Skipworth conducted his own pieces with precision and intense, brow-furrowing concentration – most likely to navigate the frequent and hectic changes in time signature. 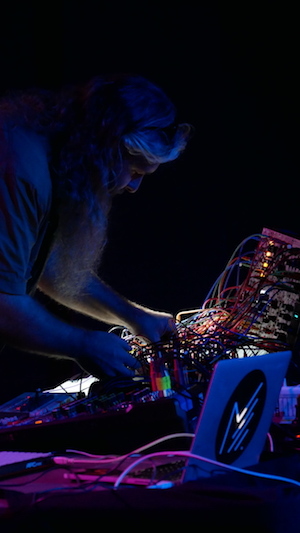 His works feature waves of restless arpeggios – oscillating, weaving, reversing, blurring the boundary between acoustic and electronic sound. As my partner put it, Skipworth’s pieces sound “like Jaga Jazzist but more refined”. It’s a good example of the kind of music that gets labelled these days as “Classical-Crossover” – it’ll impress your arty friends; it won’t alienate your normie friends. As for my own baggage, I left “Sensory Horizons” with unexpected feelings of optimism and self- acceptance. I realised there was no shame in admitting that, for several years, the programming of new music in Perth just didn’t strike a chord with me. I felt great respect for Intercurrent – not just for being exceptionally talented musicians, but for initiating this passion project of theirs, for seeing a gap and filling it. And I’m grateful that they inadvertently validated my own musical tastes; I have always been a (not-so-closeted) minimalist myself. Top: Intercurrent performing “Sensory Horizons”. Pianist Gabriella Smart takes the audience on a journey inspired by the narratives of two pianos from colonial Australia: Percy Grainger’s childhood piano, and the first piano to be transported to Alice Springs, reputedly on the back of a camel from Oodnadatta. Leading composers Cat Hope and Erkki Veltheim have transformed narratives surrounding these pianos to create works that are inspirationally original and unique. Hope instills the piano with theremin like qualities, inspired by Grainger’s Free Music, while Veltheim morphs history with contemporary culture where morse code is played on colonial piano to spell out the world’s most retweeted tweet of January 2015, reflecting our universal obsession with trivia. The result is music that is mesmerizingly beautiful, and sharply confronting. Intercurrent returns with Sensory Horizons, an eclectic program stretching ears to the far ends of sound and emotion. Piano, percussion and clarinet virtuosity sit at the centre in a program of exciting new and existing works. From Georgian Hymns to birds in flight, Intercurrent will explore new sonic horizons. Percussion, clarinet, electronics and piano with special guests. American composer John Supko layers samples of experimental poetry over long melodic lines to create his immersive and poignant This Window Makes Me Feel. Kate Moore’s Spin Bird stretches the soloist’s mastery of technique, pushing closer to the exhilaration of flight. Julian Day’s much anticipated and new work Low Horizons layers the ensemble against a warped electronic version of itself to powerful effect. Evan Zyporyn’s Tsmindao Ghmerto reimagines an ancient Georgian Hymn for vocalising bass clarinettist to colourful and arresting effect, while Witold Lutoslawski’s Subito is a brief burst of fiery virtuosity and stark emotional contrasts. Finally, the ensemble expands to a sextet formation for the premiere of two new works of Intercurrent’s own Lachlan Skipworth. The human ability to deny death and mortality mirrors our denial of climate change and the rapid destruction of the earth’s ice covered poles. Accomplished WA sound artist and composer Rachael Dease spent a month in the Arctic Circle in 2017 during the midnight sun, sailing amongst the collapsing glaciers. For Like Embracing Ice she has scored a work with audio captured from the depths of the Arctic Sea, using hydrophones floating under drifting icebergs and microphones lowered into glacial cracks. 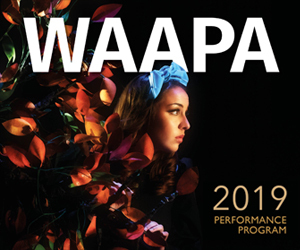 Dease graduated with Honours in Composition from WAAPA. Her award-winning practice encompasses the realms of art music, pop culture, theatre and science. Pictured: Rachael Dease, Like Embracing Ice (Ytre Norskøya Votive #11) (detail), 2017. Photography by Rachael Dease. Louise Devenish is a WA based, virtuoso percussionist specialising in New Music — or if you prefer post-Romantic, post-Classical art music. On Tuesday, Perth’s Sewing Room saw the beginning of her national tour to promote the release of her album music for percussion and electronics, comprised of specially commissioned works by various Australian composers. The recording, and hence the concert, represents the culmination of considerable work and refinement of this repertoire, much of which has been premiered in previous Perth concerts. Here, Devenish performed from memory, without written scores, an impressive feat which provided an unadorned setting for the performer’s very intense focus on her instruments and their nuances. For those in the know, the concert constituted a “greatest hits” of Devenish and of those with whom she has been working. Not so effective was the use of visual projections from Ross Karre, which might work if the seating was elevated or raked. Instead, these were obscured by the less than ideal seating provided by the groovy but frankly unforgiving and unsympathetic setting of The Sewing Room. Cat Hope’s “Tone Being”, for example, especially suffered compared to the 2016 performance in the acoustically insulated and focused State Theatre Centre Studio. Devenish attacked the gong with extremely measured and distinctly separated sonic gestures, punctuated by quite long gaps in which we contemplated with her various reverberations, low bass sounds in the speakers, or indeed almost nothing. The Sewing Room does not support this sort of listening well. Nevertheless, Devenish again demonstrated the particularity of her precise and almost (to my mind) thoughtfully neo-classical approach to her instruments. Austere and serious, her gestures were sparse, focused and concentrated. The concert opened with Andrián Pertout’s “Exposiciones”, which pairs a recording of what sounds like a very old clock with Devenish live on glockenspiel. The clockwork thunks in the recording are irregular, gently building before snapping over. This counterpoints beautifully the scintillating materials provided by Devenish on glockenspiel. Pertout’s program notes make his rhythmic and temporal structure sound devilishly complex, but perhaps because I am a lover of funk, and, as he says, the thunks of the clock serve to mark “the downbeat” as in funk, it actually sounded like a relatively straightforward interdigitating of off-beats and asymmetric accents. In terms of sound quality, if not rhythmic patterning, it felt to me like a hyper-complexified version of Aphex Twin’s “Nannou” or perhaps even “On”. 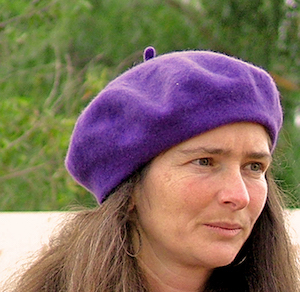 Kate Moore’s “Coral Speak” is one of a suite she has written about the Great Barrier Reef. Chris Watson’s extraordinary and masterful field recordings have shown us that despite the apparently quiescent appearance of coral, it actually makes quite an active sequence of “snaps, crackles and pops”. Moore uses what sounds like processed chimes as the backing for her work, and while the electronics gradually morph into a pleasant enough background field, I cannot say I felt there was much connection between this inexactly moving around set of glassy/rocky sounds, versus the attractively measured rising and falling doubled strikes of the vibraphone. The best solution was to ignore these frankly annoying electronic elements altogether and focus on the live sound in the space. The five movements of Stuart James’s work offered a diverse and meditative selection. Photo: Rachael Barrett. The stand-out work in the concert was, therefore, Stuart James’s masterful work for electronics and “deconstructed gamelan” — that is to say gamelan gongs taken out of their frame and arranged in a non-sequential order. 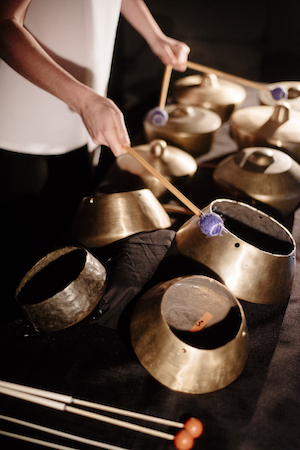 From small gestures using the upturned gongs as resonant bowls, to more layered, interactive sections where an irregular pulse and unresolved harmonics come into play, the five movements of the piece offered a diverse and meditative selection which also, at times, had urgency and power. Unexpectedly “small” or timbrally thin and high-pitched sections build and then evaporate in the face of sharp stick cracks, whilst a slightly watery and recognisably electronic or electroacoustic backing moves around within the performance space behind Devenish like a series of crunchy, mercury waterfalls. There is a lot to attend to here, both in terms of temporal accents and the relationship of sound textures. James’s program notes offer an almost spiritualist interpretation of the piece, stating that, “The essence of sound is the breath, the compression and rarefaction of kinetic energy passing through the air.” I am not altogether convinced such concepts are clearly communicated by the music, or even that they could be. Nevertheless the piece has a rich, sonic gorgeousness, warmth and mystery which insists on dense contemplation. This might well be James’s first masterwork, beautifully brought into being by WA’s leading percussionist, Devenish. 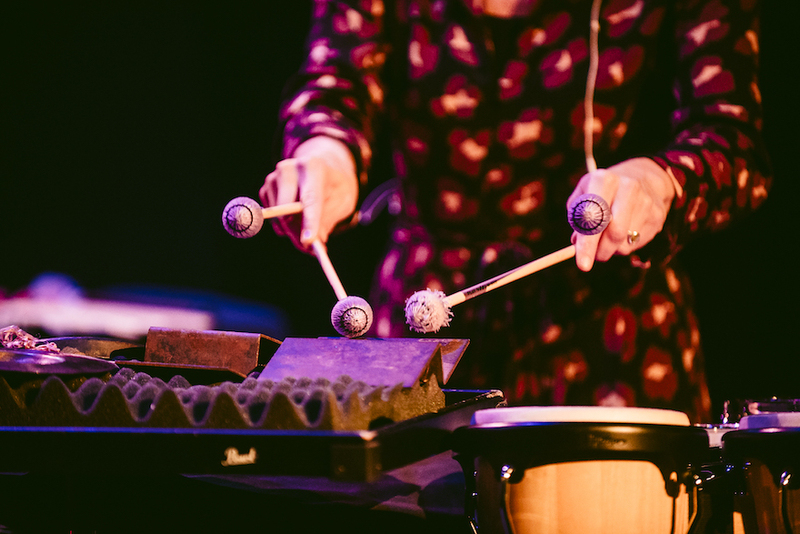 Louise Devenish’s “music for percussion and electronics” is touring to Adelaide (20 May),Brisbane (22 May and Melbourne (24 May). Pictured top: Louise Devenish at The Sewing Room. Photo: Rachael Barrett. The attractive annual season of lunchtime recitals at St George’s Cathedral is now under way, and Wednesday’s was the second off the blocks. 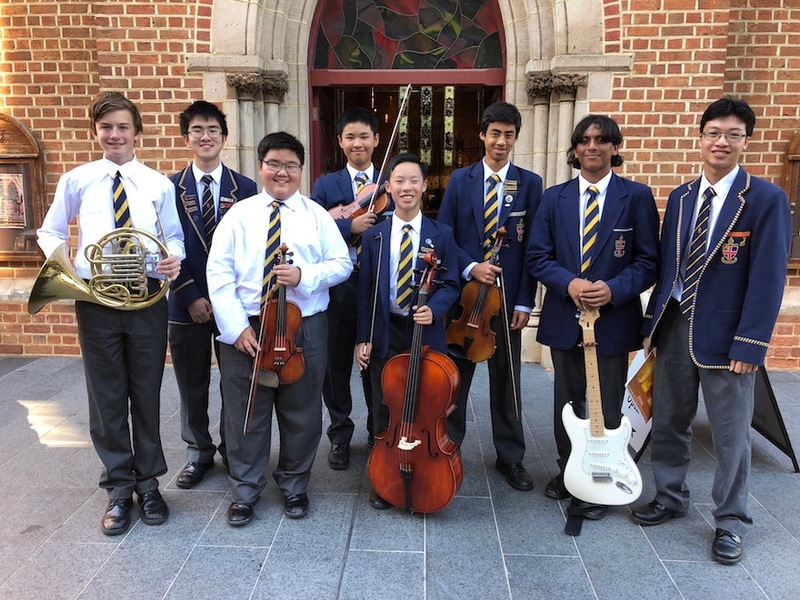 The featured recitalists were the “Talented Music Students from Christ Church Grammar School”, as the programme put it, and they met that description through the full age spectrum of the senior years, 7 to 12. 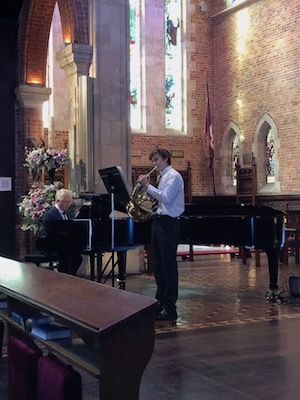 The potentially intimidating task of opening the concert fell to Year 12 student Akio Ho (pictured top), but as he had the Cathedral’s new Fazioli concert grand on which to play Gershwin’s Prelude No 1, he might well have regarded the challenge as a privilege. It was one to which he was certainly the equal. Joshua Chen faced challenges of a different sort in “Julie-O” for solo cello, composed by Californian Mark Summer, one of the founders of Turtle Island Quartet (who visited WA for the Perth Festival some years ago). It is something of a virtuoso piece requiring the soloist to mix techniques in rapid succession during its four minutes, which Chen did coolly and effectively. The mellow tones of Felix Mendelssohn’s Andante for French Horn in the self-possessed control of Ruben Davies made for a pleasing contrast and set the scene nicely for the Rondo movement from Mozart’s Duo in G Major for violin and viola, confidently executed by Daniel Zhou and Christian Wong respectively and providing a highlight of the recital. 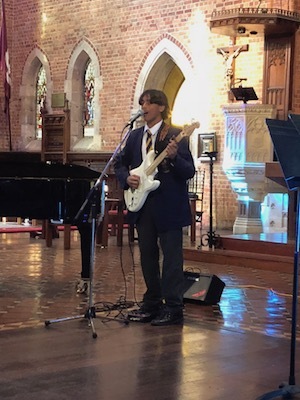 By this stage in the proceedings one might have thought that Christ Church had no vocal tradition to display, but Arman Brian’s performance of “I’m Not The Only One”, by popular young English singer-songwriter Sam Smith, proved otherwise. Arman demonstrated great skill in vocals and electric guitar, both of which responded well to the cathedral acoustic, drawing an enthusiastic reaction from the mainly older audience, clearly undaunted by the modern idiom. Wieniawski’s Polonaise No 1 in D Major is something of a show-stopper, beloved of violin virtuosi through the ages. William Wu, the youngest musician on the bill, launched into the famous old warhorse with a confidence that he justified by maintaining accuracy and intensity all the way through to the final bar. That was going to be a hard act to follow, but the almost-identically named William Hu did just that by playing, with sensitivity and aplomb as required, his own impressive piano composition, “Rhapsody”, and navigating its virtuoso moments with total assurance. There was a warm reception both for it and for the recital as a whole, which the music staff must most certainly share with today’s students. One would be intrigued to hear another vocal item next time, be it choral or in smaller combination… but that is being greedy! “Concerts at One” take place at St George’s Cathedral, at 1pm on selected Wednesdays until September 19. Denmark will be awash with harmonies over the WA Day long weekend, when hundreds of people descend on the town for its annual Festival of Voice. Nina Levy caught up with the Festival’s artistic director, Vivienne Robertson, to find out more. Vivienne Robertson: This is the fifteenth year of the Festival – it started as a grassroots, small-scale festival about the joy of community singing, and for many years its focus stayed on choirs and community song. That’s still the heart of the festival – how magical it is when people come together to sing – but over the past few years DFoV has also morphed into an all-encompassing celebration of the power and beauty of the human voice. Song, story, spoken word… and this year, we introduce the beauty of visual voice with WA Deaf Arts. NL: How did you come to the role of artistic director? VR: This is my fourth year as artistic director of the Festival. I have been the artistic director of Denmark Arts (the organisation that presents DFoV) for seven years, and in that time, intimately involved with DFoV. Four years ago we didn’t have a Festival AD, so I stepped into taking that role as well. I love voice – Sufi chant is my personal thing – and I’ve steered the Festival into incorporating a strong focus on “voices from the edges” – First Nations, refugee, inclusion, experimental… as well as more focus on the varying ways of voice, including story-telling and spoken word. 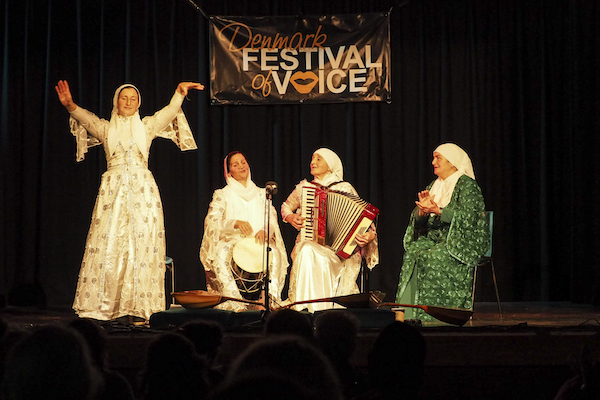 “The Festival is a mix of Denmark’s own amazing performers and presenters alongside national and international acts.” Ensemble Aznash Laaman Photo: Hazel Blake. NL: So DFoV encompasses more than just singing… tell me more, tell me more! VR: It’s about “voice”. As well as song, story and spoken word, that means exploring ideas about voice. It’s all in there – and, because it’s an intimate festival, you get a small amount of everything – the cream of “voice”, if you like! In addition to performances, there are also 28 workshops – from Gregorian chant to beatbox, Indian vocal percussion to slam poetry, Auslan to the voice of mime… and we have a special one day workshop on the Monday on breath with shakuhachi master Dr Riley Lee. So we’re big on participation – letting people experience the wonder of their own vocal adventure, finding new sounds in their mouth. The story-telling is in a beautiful hand-made yurt running a program of skilled tellers, mainly, this year, from Noongar and immigrant backgrounds. Denmark is an intensely musical town and the Festival is a mix of our own amazing performers and presenters alongside national and international acts. NL: What are some of the highlights of this year’s festival program? VR: We are featuring some fabulous acts: Perch Creek, the Yabu Band, Riley Lee, Ziggy Ramo, Carla Geneve, Men of the West, Elena B Williams…. but perhaps this year our spoken word program is a real highlight. We’re honoured to be presenting Bilya Kep Waagnkiny from Northam, and three local elders as speakers/story-tellers in our “Voices of First Peoples” thread; we have a poetry slam run by TedX speaker and Australian Slam Champ Jesse Oliver; the Centre for Stories is attending with four guest story-tellers and we have a wonderful panel on “Voice and Identity” featuring Kim Scott, Pakistani poet Zainab Zahra Syed, Rae Gibson from WA Deaf Arts, Matthew and Daniel Bacon on gay/transgender issues and Yabu Band’s Noongar/Wongi lead Delson Stokes. Also special are the “Thonglines” and “5 Days not 5 Years on Manus Island” projects – film/exhibition/song/talks about and from asylum seekers, and our two guest migrant/refugee background story-tellers Hossein Bouazar and Esther Amito Onek. “The story-telling is in a beautiful hand-made yurt running a program of skilled tellers, mainly, this year, from Noongar and immigrant backgrounds.” Photo: Hazel Blake. NL: The festival looks HUGE… how do you fit so many acts into a small town like Denmark? NL: What are your tips for festival-attenders in terms of how to get the most out of the weekend? VR: It’s always interesting at festivals – some people study the program, circle who they want to see, some people go with the flow, others fall in love with a particular venue… I think it can be powerful to embrace what you know you want to experience, as well as going to something you wouldn’t normally go to. The Denmark Festival of the Voice takes place in Denmark, 1-4 June. 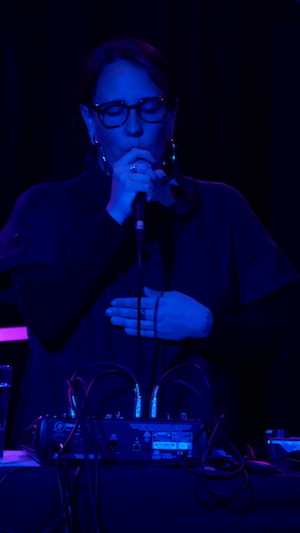 Pictured top: Apakatcha at the Denmark Festival of Voice in 2017. Photo: Hazel Blake. WASO celebrates the 100th birthday of the composer of West Side Story. Composer, conductor, educator – Leonard Bernstein was quite simply one of the greatest musicians of the twentieth-century. Extravagantly talented and boundlessly creative, he fused genres and styles to create quintessentially American music. To mark the 100th anniversary of Bernstein’s birth, Benjamin Northey conducts a spectacular program showcasing ‘Lenny’s’ work for Broadway, film screen and concert stage, from the streetwise West Side Story to the hopeful and uplifting Chichester Psalms.